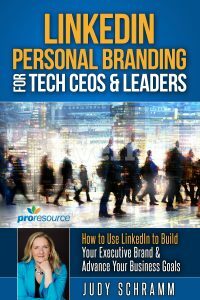 According to LinkedIn’s member research, four out of five LinkedIn members can impact business decisions and have two times the purchasing power of the average U.S. adult who is online. No doubt, LinkedIn is a valuable place to generate leads for your business. Doing organic activities there can help you find prospects. But when you add the power of targeted ads, your lead generation efforts will soar. 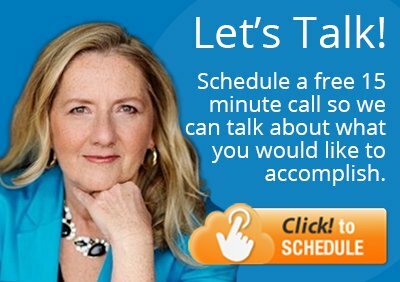 Effective prospecting in LinkedIn takes time to gain visibility and build trust. You can’t build trust until you get your company in front of people. To make things harder, some LinkedIn Groups don’t allow contractors or vendors to join. And even when you join the right groups, your ideal prospects may not participate. So how do you gain visibility and begin building trust? The answer is LinkedIn Sponsored Updates and Ads. They let you do precise targeting to get your company in front of the right people. Owned: Digital properties that company owns and controls such as website, blogs, and apps. Earned: Content and reviews that are shared, liked, and commented on by fans. Nielsen’s Global Advertising Survey lists “recommendations from people I know” as the No. 1 trusted form of advertising. It’s no surprise that earned is the most trusted of the three. Still, prospects need to notice your company before it receives any earned media. You start with owned media to get your company out there and attract search engines. You’ll also set up landing pages and other content people will want once they learn about your company. Next, add paid media targeted to your market to build branding and name recognition. These ads need to have a call to action that sends prospects to your owned media. Thus, a converged marketing strategy with all three types sees the most success. You have two options for paid media on LinkedIn: Sponsored Updates and Ads. There are other advertising options such as Lead Accelerator, sponsored InMails, and sponsored Groups but Sponsored Updates and Ads are the ideal starting points because they’re affordable and work on a smaller scale. Companies that have a LinkedIn Company Page can post updates that share resources and report news. These updates can reach a greater audience when you opt for Sponsored Updates because they extend your reach across devices (desktop, smartphones, and tablets) and to non-followers. Sponsored Updates appear on the home page where you see updates from your contacts and companies. Notice that some of these updates say “Sponsored” as the following screenshot shows. It would’ve been easy to miss the update from Unilever had it not been for the sponsored update. Something in this profile matched up with the company’s targeted audience. In creating a Sponsored Update, your targeting options include companies, job titles, job functions, seniority, education, geography and more. You set the budget and choose either cost per click or cost per impression. Direct Sponsored Content can help you test your messaging as you can target different content to different audiences without publishing the content on your company or showcase page. The downside is that it has a 160-character limit and uses text only. Direct Sponsored Content resembles a Sponsored Update except it appears in the homepage newsfeeds of members who meet your targeting options. It’s easy to sponsor an existing update. 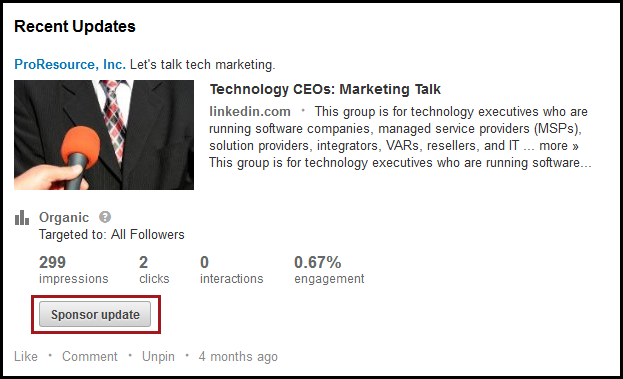 Go to your company’s page and select “Sponsor update” or visit https://www.linkedin.com/ads/. For current ads, you won’t be able to change the content of the update. The nice thing about Sponsored Updates is that it can lead to earned media because prospects can Like, Comment, Share, or Follow the update. When you play your cards right in creating high quality content like LinkedIn blog posts, it compels people to share your update. The trick is to write posts that educate prospects on the need for your company’s solution, identify the problems it solves, and answer commonly asked questions. Another effective blog post is one that hits on hot topics in your industry. To make the most of the blog post, add a call to action that sends prospects to a landing page on your website. This helps move them into the next step of the buying cycle. You can review analytics to figure out what works and what doesn’t work. Options for LinkedIn Ads include text, images, or a video. You can create 15 variations of an ad that contains different images, URLs, calls to action, and copy. 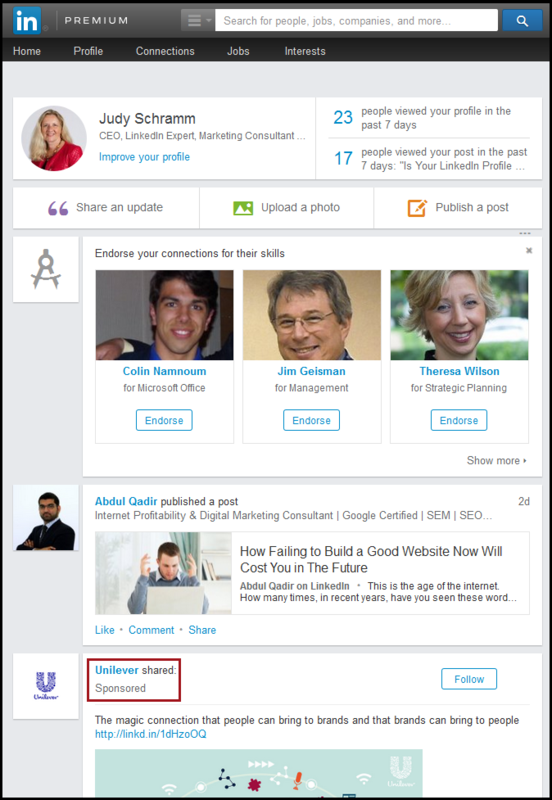 LinkedIn Ads appear in the column next to the homepage newsfeed as shown in the image. Text ads work well for branding because click rates are low. It requires constant tweaking to keep the impressions up. Or you could swap in paying per impression from time to time. Beware that if users have an ad blocker, they may see a blank spot instead of ads. Compared to Sponsored Updates, ads are smaller and look — as its name implies — like an advertisement. Copy is also limited and the image is smaller. We like to use these ads for branding – they give you a way to keep your photo, logo and marketing message in front of the people you are targeting. Relying only on owned media will make your job harder and take longer to achieve results. To optimize LinkedIn for your company, you’ll want to ensure you have owned media in place ready to receive prospects who find their way there. Then you’ll want to invest in paid media for eyes landing on that content. Owned and paid media together will boost your chance of getting earned media.